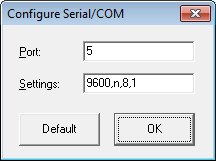 - Serial/COM port and other necessary settings to connect swDuino with Arduino are configurable. - A dedicated plug-and-play Arduino library is available which can be easily integrated in sketches. 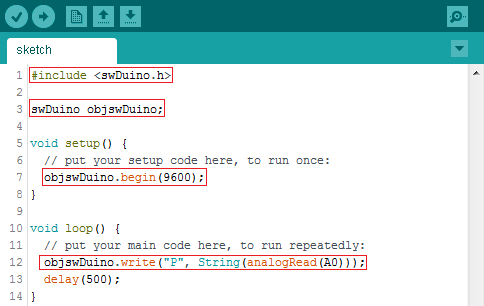 - With Arduino library, variable's value (or data) can be sent from Arduino to client program. - It enables Arduino sketch to do any thing (e.g. change state of pin etc.) on receiving variable (or data) from client program. - HTTP/Web server listening port can be configured as desired. The server is multi-threaded. - To develop web browser GUIs for monitoring and controling Arduino, HTML and other supporting files (images etc.) can be placed in /files/ sub-directory structure. - Web server supports powerful set of Web APIs to control and monitor Arduino which can be used by client program to monitor and control Arduino.